Beautiful certificate from the York Railways Company issued in 1934. 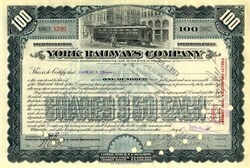 This historic document was printed by American Banknote Company and has an ornate border around it with a vignette of an old electric railway car with a scene from the turn of the century. This item has the signatures of the Company's President and Treasurer and is over 74 years old. Electric trolleys began moving passengers around York County in 1893 when the majority of roads were dirt and the horse was the main form of transportation. Closed cars and smooth rails offered year-round comfort for local transportation. At its peak in 1923, York Railways Company streetcars carried almost 11 million passengers. They operated 68 cars operating over 85 miles of tracks. Between 1936 and 1950, a holding company formed by General Motors, Firestone Tire, Standard Oil of California and others bought more than 100 electric streetcar systems and converted them to routes serviced by General Motors buses in 45 cities. Some speculate whether this was a direct attempt by National City Lines to end the use of trolleys. To keep the line alive, the York Railways Company intended to use the profit from selling energy for track replacement in York. However, because of a Pennsylvania Public Utility Commission ruling stipulating that the transfer of these funds would result in a subsidy of transit riders by energy consumers, repairs could not be made. Unable to finance the upgrades, York Railways went bankrupt. Trolley ridership was transferred to a bus company, and York Railways Company ceased operation in 1939.